If you have visited the https://trials.dynamics.com website and started a Dynamics 365 Business Central trial, you might think there are some premium features missing like Manufacturing and Service Management. Until recently, it was instructed to go through a CSP Provider to get access to the premium Dynamics 365 Business Central trial. Now, it’s only a quick search and a couple clicks away. If you are a Microsoft Partner, you can visit https://demos.microsoft.com and request a new Microsoft 365 Business Demo Content tenant environment to create a brand new demo tenant. From there, you can go to https://trials.dynamics.com and add the new credentials for the Dynamics 365 Business Central Trial. If you are a Microsoft Customer, you will want to add the trial to your existing Microsoft Tenant. To do this, go to https://trials.dynamics.com and add your Microsoft login ID when requesting a Business Central Trials. In both cases, you will need to complete the required steps to proceed and you will have access to Dynamics 365 Business Central Essentials Trial environment. 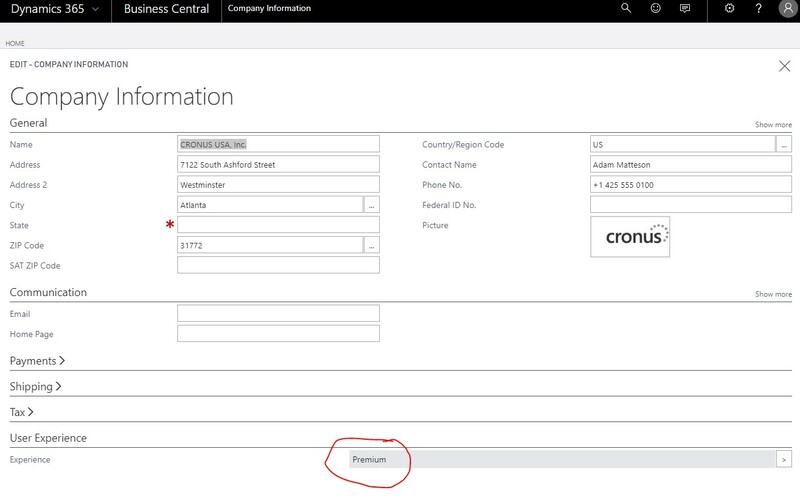 To convert the Dynamics 365 Business Central Essentials Trial to a Premium, click the search icon in the top ribbon and start typing “Company Information”. Select Company information and change the User Experience from Essentials to Premium as outlined in red below. Next, close the pop out window and refresh the page. From there, you can click the search icon again and start typing “Manufacturing” and you can begin to explore the premium features that you now have access to within your Dynamics 365 Business Central Trial. If you have a positive experience with your trial, you’ll be happy to hear that the Dynamics 365 Business Central October 18 release is equipped with some very important, process-enhancing capabilities. The October 18 release also enables on cloud, on-premise, and hybrid Dynamics 365 Business Central deployments and allows Dynamics NAV solutions to connect to the cloud through Business Central. If you have questions about Dynamics 365 Business Central trials, features, or deployment options, send our Dynamics 365 Business Central consultant an email and ask away!